Three decades or more ago this triangular shaped lot, with many very old broken gravestones, toppled over and covered in vines, had a wonderful atmosphere to it. It was in a state of decay yet you could feel the history just by looking over the iron fence. 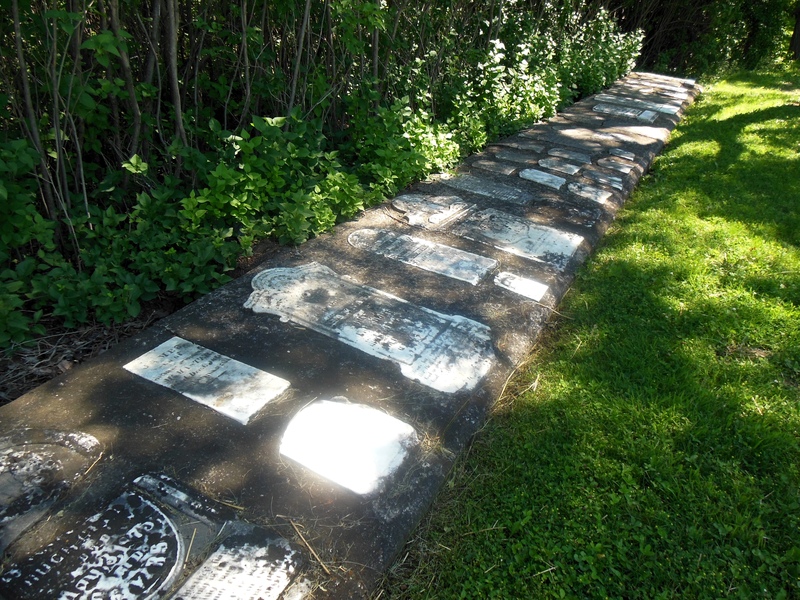 The Milton Historical Society undertook the task of preserving the early gravestones, and in 1986 the restoration of the cemetery was complete and a ceremony was held to unveil the plaques and cairn. In Memory Of / Milton’s Founder / Jasper Martin 1797-1833 / Sarah Coates His Wife 1797-1830 / Settled Here From England In 1818 / The Martin Family. 1986 / Milton Historical Society in co-operation with / The Town of Milton / Maplehurst Correctional Centre. I can understand the need to preserve these old stones from further deterioration, but the placement of them in concrete slabs bordering the cemetery has given it a clinical feel. It just doesn’t feel like a Pioneer cemetery any longer. 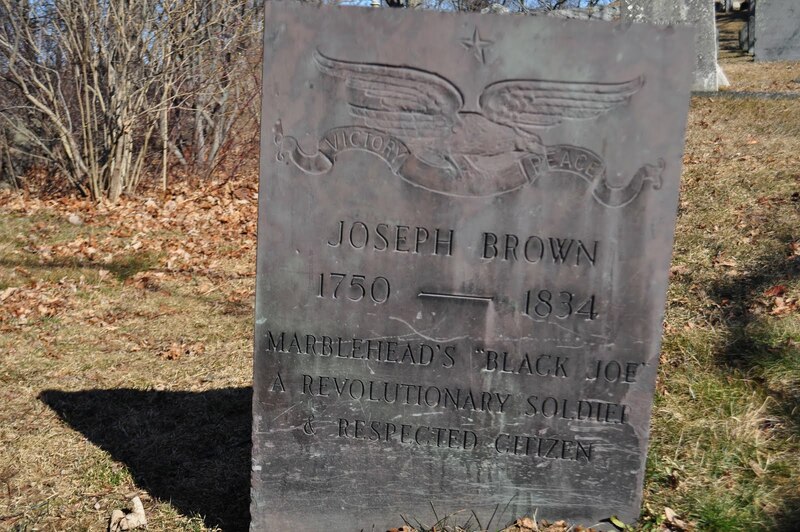 This ancient burial ground (the earliest date on a headstone is 1755 and the latest is 1917) is now preserved by the Town of Milton. One of the few remaining gravestones in good condition is a tall column with 4 inset panels bound with rope detail containing two hands in a handshake with oak leaves in 4 corners. An inscription below states, I Am The Resurrection And The Life / Because I Live Ye Shall Live Also. A second panel in bas relief shows a kneeling figure clinging to the crossbar of a cross. The legend is inscribed with Here I Lay My Burden Down / Change The Cross Into The Crown. The top of the column is draped and terminates in an urn with a blaze. Oak leaves mean strength. The oak is believed to have been the tree from which Jesus Christ’s cross was made. 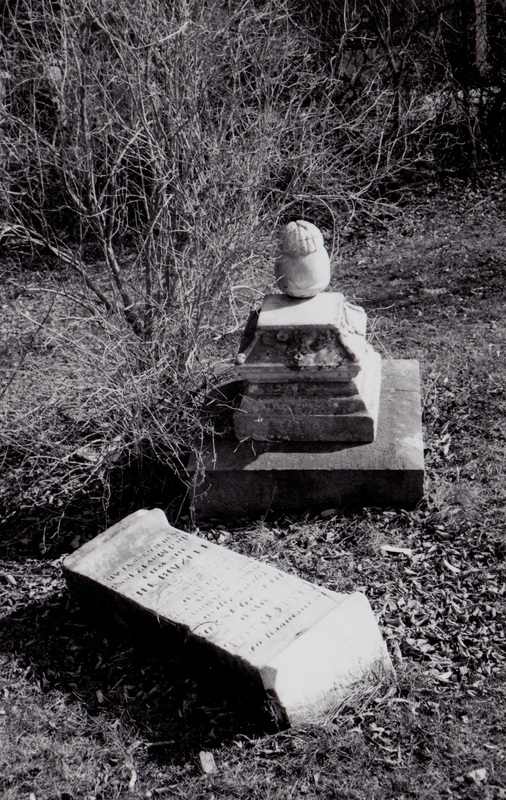 In smaller pioneer cemeteries, it was commonly to situate children’s graves near oak trees. In Aztec culture, a goddess who was also Queen of the Underworld was responsible for watching over the bones of the dead. 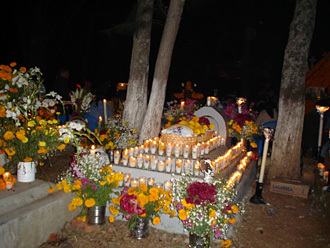 Día de Muertos, derived from this belief, is a festival celebrated throughout Mexico and other Hispanic countries to celebrate family and to pray for their spiritual journey. It is celebrated on October 31st in the belief that the veil separating the deceased and the living is removed to allow deceased children to visit the earth for 24 hours. 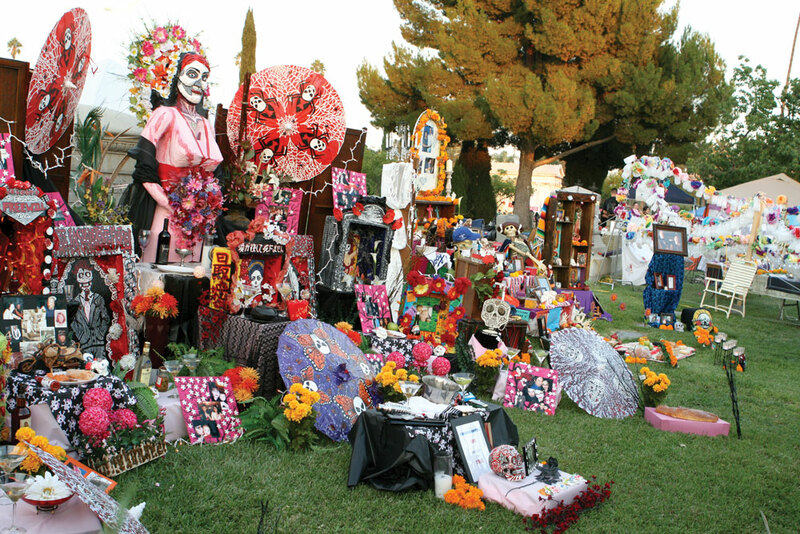 It is known as Dia de Los Angelitos, “Day of the little Angels”. Adult spirits join the festivities on November 1st and are welcomed with food and drink. 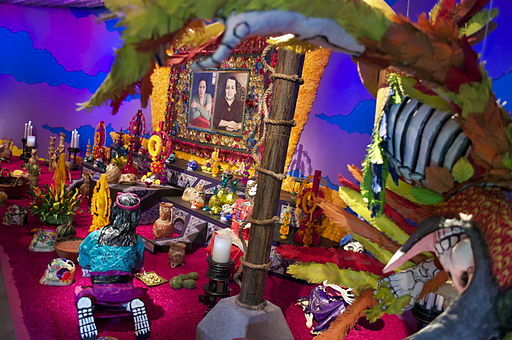 Altars to the dead are erected in homes and the cemeteries where their loved ones are buried. Lighted by a multitude of candles as part of the vigil. 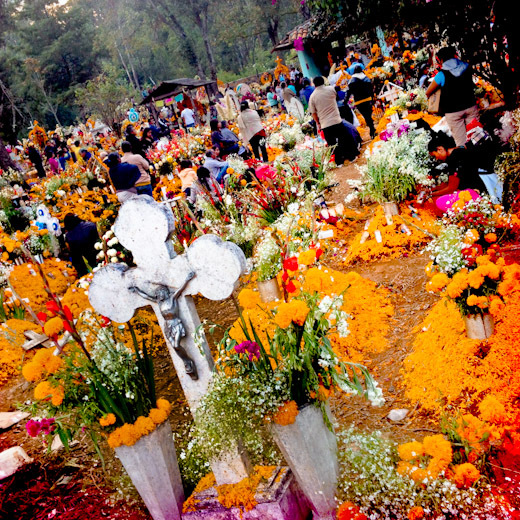 Orange marigolds (Flor de Muerto) believed to attract souls are used in in the decoration of these altars and cemeteries. 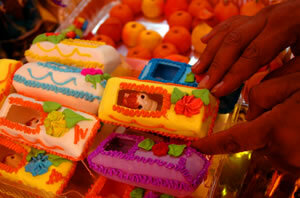 Preparation for the festival begins weeks in advance where sugar art, introduced to Mexico by the European missionaries, is widespread in the stores. 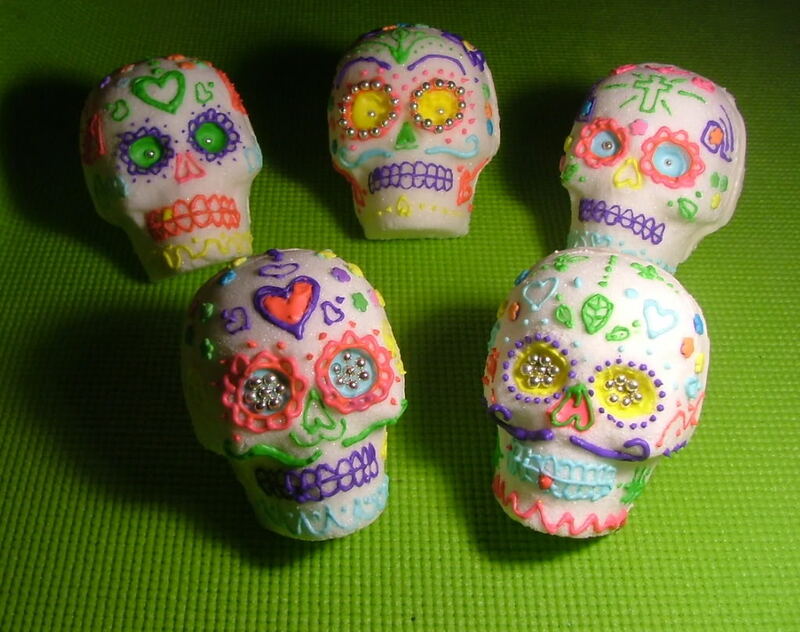 Sugar decorations of skulls, coffins and skeletons are created in remembrance of departed love ones. The skull is decorated with symbols representative of the departed soul with the name written on the forehead. Always cheerful and colorful to capture the memory of the loved one, they are placed on the gravestone to welcome the soul. Calaveros is a Spanish word meaning skull that has also become known as a satirical poem during the festival. Fake obituaries are written in poetic form to make fun of people and are often slightly insulting. The skinny one named “Death” just had her way. So blue and purple he came to be. And in your name, we’ll have some cake. City newspapers publish these poems in a special section. Writers are also hired by the newspaper to mock famous people and politicians. 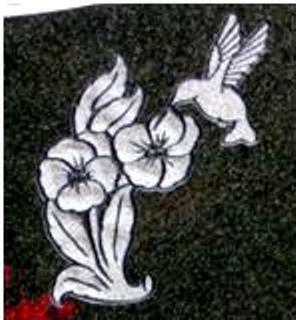 Birds are a common symbol on gravestones. 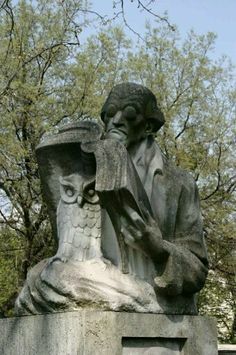 An owl represents solitude; a warning of impending death; watchfulness; or wisdom. A rooster often found on weather vanes indicates vigilance and was installed to guard against evil. 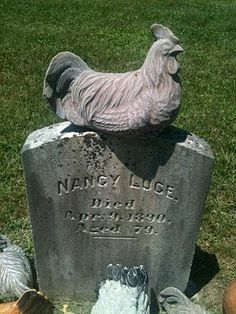 On a gravestone, the rooster signifies the awakening and the resurrection. An eagle is a recognized symbol of a military career, and is symbolic of courage and valor. 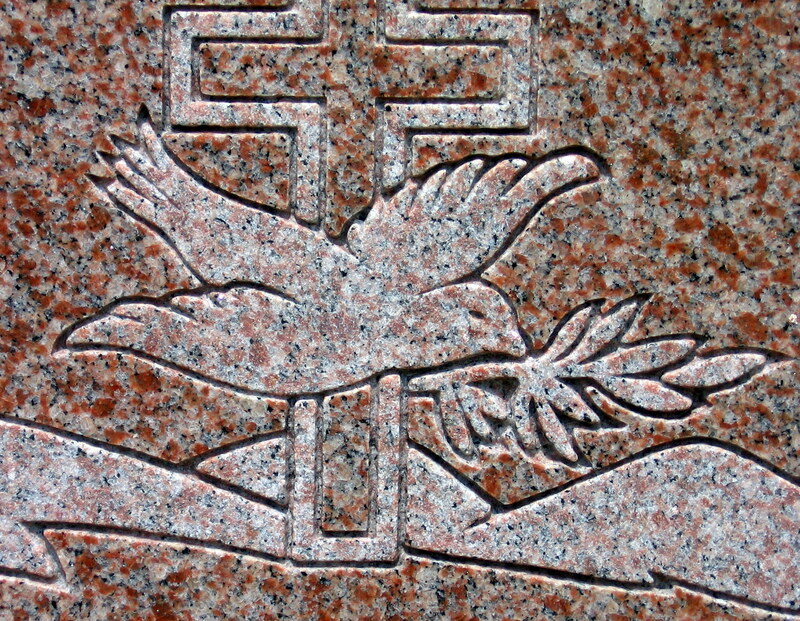 However, the most common bird images on gravestones is a dove, On Christian gravestones it represents the Holy Spirit. 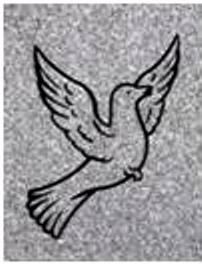 On Jewish gravestones the dove represents peace. The white dove is symbolic of purity and spirituality. 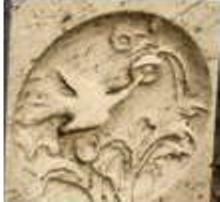 A dove holding an Olive Sprig represents hope or a promise and is universally recognized as a symbol of peace. 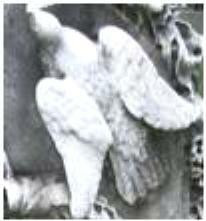 Winged doves are recognized as a symbol of the soul of the deceased ascending to heaven, and therefore represents the resurrection and rebirth. 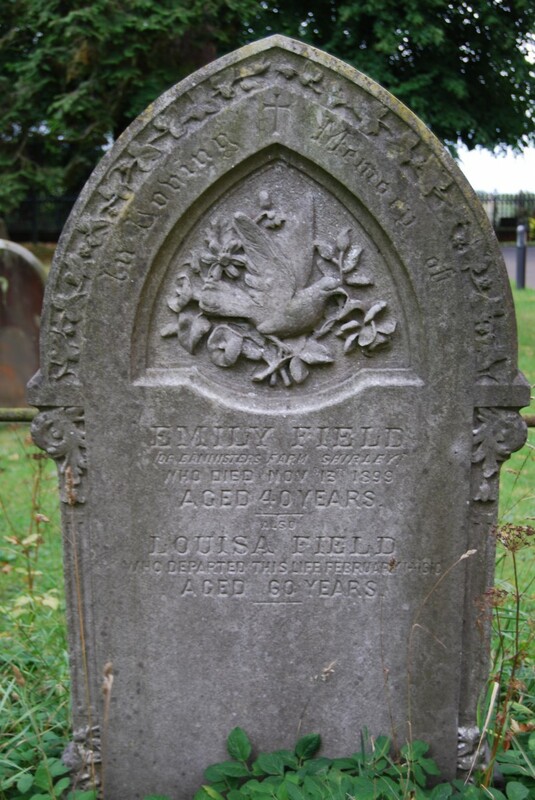 The unbearable grief of losing a child was commonplace in the 18th and 19th centuries. However, the Holmes family of Glastonbury was dealt an unfair share of grief when they lost four sons in the span of two months. 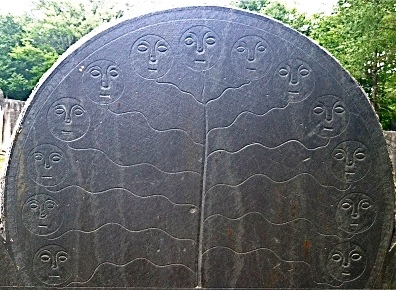 The Holmes children’s grave is located in Eastbury Cemetery, Glastonbury, Connecticut, U.S.A.
Four profile heads divided by the tree of life are carved across the top of the stone. The tree of life contains 13 branches; 4 of which have been cut short. 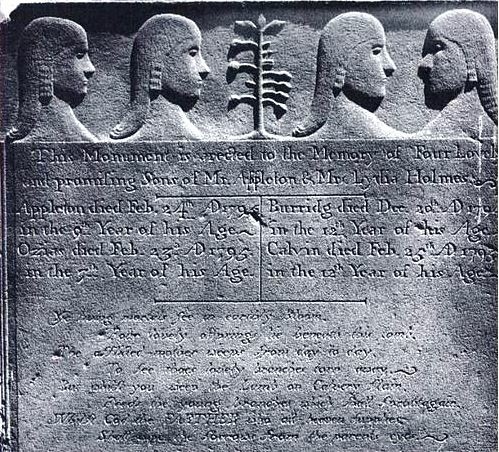 The shortened branches on the right and the three heads with right facing profile symbolize those who died in 1795. 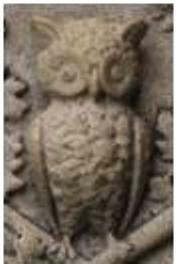 Burridg, the left facing profile, who died in 1794, is represented by the shortened branch on the left. This monument is erected to the memory of four lovely / And promising sons of Mr. Appleton & Mrs. Lydia Holmes / Appleton died Feb 24th AD 1795 / In the 9th year of his age / Ozias died Feb 23rd AD 1795 / In the 7th year of his age / Burridg died Dec 20th AD 1794 / In the 12th year of his age / Calvin died Feb 25th AD 1795 / In the 12th year of his age. Four lovely of springs lie beneath this tomb. To see those lovely branches torn away. Feeds the young branches which shall sprout again. Shall wipe the sorrow from the parents eyes. 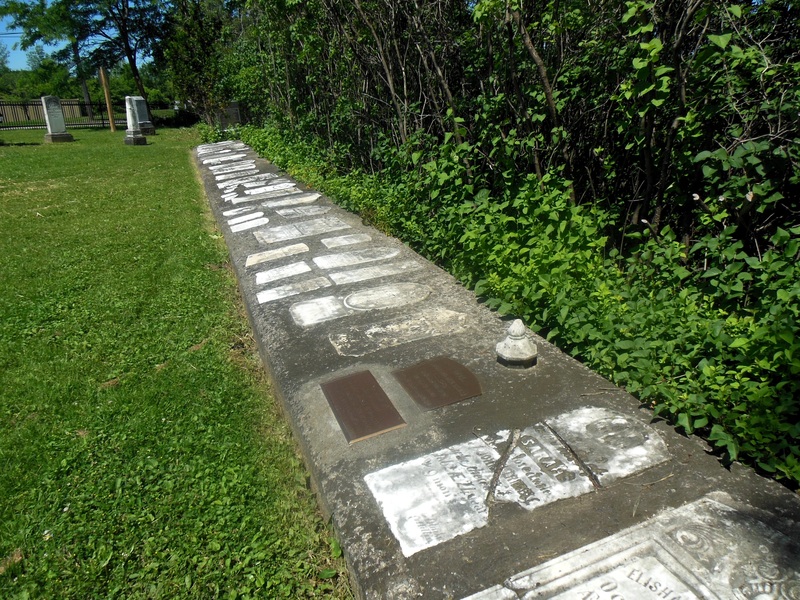 Buried in Burgess Cemetery, Grafton, Vermont, U.S.A., Rebecca Gibson Park, mother of 15 children of whom only one survived infancy, died in 1803 at age 40. 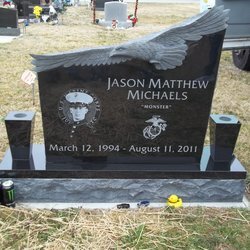 She shares a headstone with her husband. In Memory of Mrs. / Rebecca Park Wife of / Mr. Thomas K. Park / Who died Septr. 23d / 1803 in the 40th year / of her age. And turn to dust as well as I. 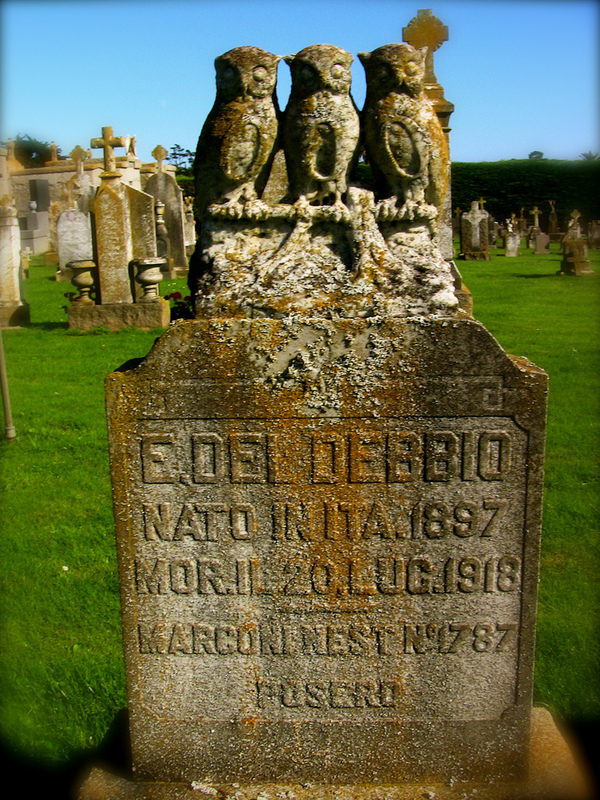 The children are also remembered on their father’s gravestone. In Memory of / Thomas K. Park Junr. / And thirteen Infants, / Children of Mr. / Thomas K. Park and / Rebecca his wife. Youth behold and shed a teer. Se fourteen children slumber here. Se their image how they shine. Like flowers of a fruitful vine. The stone arch above Thomas’ inscription contains an engraving of the tree of life with 12 branches. At the top of the tree and at the end of each branch is a circular non-smiling face. The arch above Rebecca’s inscription contains a large non-smiling face within a rectangle surrounded by a weeping willow. A small arch joining the headstones contains a non-smiling face. 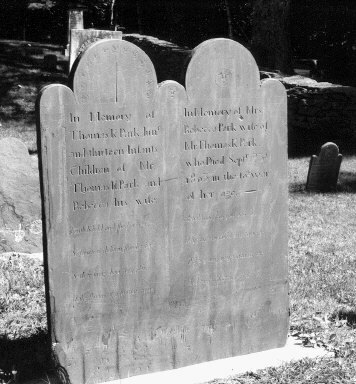 On 31st October 1780, Salla Barns, age 18 years, and her infant died during childbirth and are buried in Somers, Connecticut, U.S.A. She was the wife of Dr. Samuel Barns. Remember friends the solumn Hour. And soon a Corps myself became. 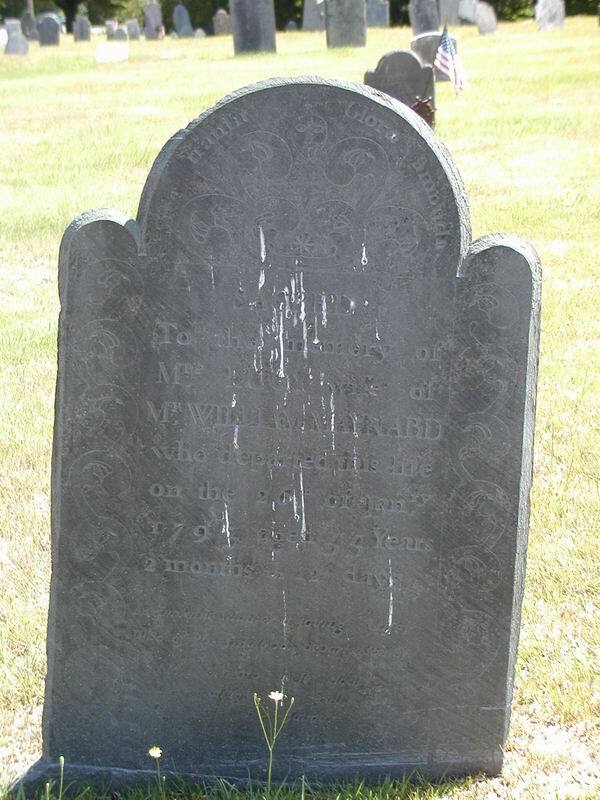 Lucy Maynard died in 1793 and is buried in the Old Cemetery, Mendon, Massachusetts, U.S.A.
Who of the small-pox departed this life. In Myles Standish Burying Ground, Duxbury, Massachusetts, U.S.A. is a memorial to a mother and daughter who drowned while travelling from Duxbury to Boston. 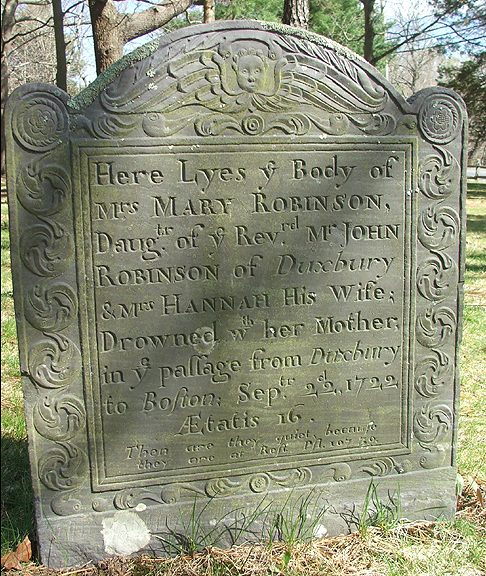 Here lyes the Body of / Mrs Mary Robinson, / Daughter of the Reverend Mr John / Robinson of Duxbury / & Mrs Hannah his wife, / drowned with her mother / in the passage from Duxbury / to Boston, September 22nd, 1722 / Aetatis (Latin phrase meaning at the age of) 16 / Then they are quiet, because / they are at Rest. Psalm 107 30.